The first time Carlos invited me to his beach house in Punta Hermosa, we immediately went body surfing. The water off the coast of Peru is surprisingly cold, so when we got out of the water, we warmed up under the afternoon sun on the porch. The beach season hadn’t started yet, so we had the porch to ourselves. He loved to spin yarns about Pico Alto. Those conversations inspired the description in Tocayos. It is a terrible wave, Pico Alto. Sullen from its long slumber, it rises heavily into a deep blue wall four stories high, eager to punish the mortal who has dared to awaken it. It takes a special man in an unusual state of mind to paddle his board into the path of Pico Alto. As the wave rises beneath him, he must thrust his arms into the water and paddle down the catapulting mass with the frenzy of a madman so he can reach the crest with enough speed to hop onto his fluttering board before the wind rips it out of his hands. As he slaps his bare feet onto the board he is suspended in a wind-blown burst of sea spray for a heart-stopping moment of weightlessness. Then he drops into the concave abyss yawning open beneath him. 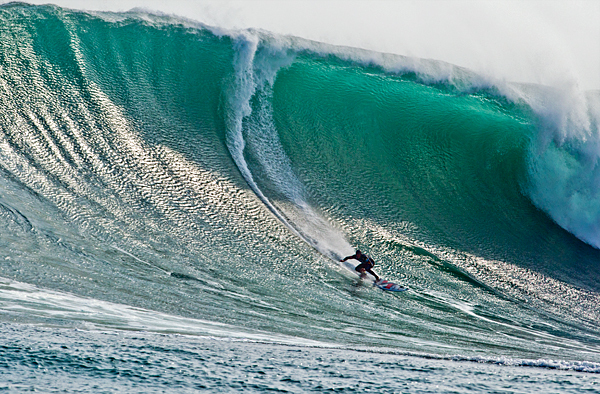 If you are a big-wave surfer, you dream of this moment. You can imagine what you will do, but until you put yourself in that place and time, you cannot know what you will do. You might drop fast enough to slip under the collapsing tonnage, and with a menace of unbelievable proportions rising behind you, find the courage to dig the rail of the board and carve a stream of starlight into immortality. O, to share heaven with the gods! To roar back up the shoulder of the wave and burst into the sight of your friends with your arms straight in the air and your shorts stiff with bravado! To know, as the board skids across the water and slows, as you drop to your chest and paddle slowly back into the lineup, that you are a Great One. Or perhaps not. It can be something as tiny as a drop of sea spray in your eye. Or a hurried waxing that allows your foot to slip on the wet board. Maybe you cannot quite find your balance. Or your nerve. The top of Pico Alto is a bad place to lose your nerve. The gods watch with disinterest as you fall that great distance with your board twisting and turning around you like a leaf in a whirlwind. When you slap into the surface of the water forty feet below, they turn away as the brute force of the wave crushes your twig of a body, thrusting you down, ten meters beneath your next breath, pinning you in a swirling, lung-bursting tumble for thirty seconds before it lets you crawl to the surface for a single gasp of foam-filled air. Only one. Because while taking that breath your panicked brain realizes that you are now in Poseidon’s Anvil, where you will experience the singular terror of turning to face the next wave unfurling four stories above you. The picture of Pico Alto, above, is from National Geographic. You can download Tocayos for $4.99 here. (You can read the first 20% for free.) I’ll have a print version available from Tattered Cover Press soon. This entry was posted in Tocayos and tagged Carlos, Peru, Pico Alto, Tocayos. Bookmark the permalink.